The 15th April holds a special place in the history of the Manufacturing Technologies Association (MTA), as it was on this date in 1919 that the Association was founded and the first meeting of its members held. To mark the centenary, members past and present have been contributing to a book ‘At the Heart of Manufacturing’, which charts the history of the Association from inception to the present day. Originally the Machine Tool Trade Association (MTTA), machine tool manufacturers from across the UK had come together to respond to the proliferation of trade shows featuring machine tools that were making demands on their time and resources. A lot has changed in those 100 years, notably the name, the Machine Tools Trade Association would later become the Manufacturing Technologies Association. The change of the name is a vital part of the association’s history and speaks as to why so many companies from the manufacturing technology sector feel at home with the MTA. The book is also a great record of how much technology has changed over the past 100 years; some of the manufacturing techniques of then would be unrecognisable today. The book was carefully put together by members of the Association by looking through historical records and recounting recent history. 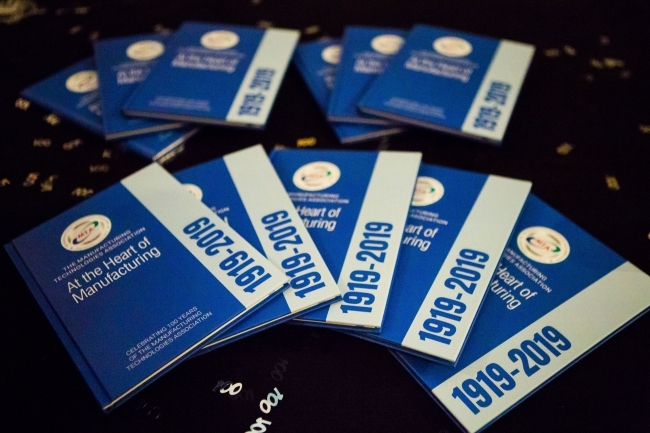 Every member of the MTA has received a copy of the publication, which was launched at the MTA’s Centenary Dinner which took place at the Westminster Bridge Park Plaza in February. The MTA is home to Manufacturers, importers and equipment suppliers who come together, in a way that few of its international competitors have embraced, to represent the whole spectrum of manufacturing technology in the UK. From metal cutting and metal forming, machine tools to software, tooling, controls, automation and new technologies such as additive manufacturing and smart systems. The Manufacturing Technologies Association has always had a strong voice; supporting their members, who push the boundaries of advanced engineering and shape the world around us in every more fascinating ways.